The Fall 2018 Polar Libraries Bulletin (Issue 80) is now live on the site. You can access it here. Past issues of the Bulletin can also be accessed on the Publications Page. The afternoon sessions on day 4 began with a talk by local librarian Mari Ekman, from the Rovaniemi City Library. She was presenting a local project about crowd funding. The name of her talk was “Archives and libraries of the people, by the people, for the people.” Ekman’s speech was centred on the concept of niche sourcing. Niche sourcing is subgenres of crowd sourcing where you get experts or amateurs with special knowledge to help the library with certain collections. By doing the project with a smaller group of more committed people, you get better quality and ensure the authority of the work and the institution. She presented an interesting project they had done here at the Rovaniemi City Library with a collection of maps. The maps were very rare and of a small area called Petsamo. They were from the 1920s-1930s and had been forbidden by the Soviet Union. Now they were no longer forbidden and needed to be made available and usable online for researchers. The participants of this project were amateur historians and elderly professionals, who digitalized the maps. The Library was only the facilitator and did no quality control. See the result of the project in Finnish at: http://Lapinkavijat.rovaneimi.fi/petsamo. He started out by giving us an impression of the changing landscapes of publishing in general. He described how Open Access is dictated from many sides and he also mentioned the serials crisis, where costs go up for subscriptions. Then the talk got more specific, as we were told the top 12 places where researchers at the Scott Polar Research Institute publish. The journals in this top 12 were primarily Open Access or hybrid between subscription and Open Access. This, he concluded, drove the prizes of subscriptions up and the cost of APC is rising too. His final conclusion was that we need to have an institutional knowledge of the total costs of publishing Open Access. After Peter’s presentation, the Lapland University Press did a presentation with many overlapping subjects. The talk was called “Northern non-profit book publisher within the global network,” given by Anne Koivula and Paula Kassinen. They told us that Lapland University Press is a small, non-profit academic publisher, established in 2005. Their publications are primarily in Finnish, but they also publish in English. The books they publish are mainly multidisciplinary. They said that everything is changing, everything is becoming open and free. This is good in many ways, but it presents a problem for the business model. Open Access is profitable for multinational companies, like Elsevier, but small publishers have a hard time keeping up. One way that small publishers could survive is if academic communities take steps to insure the integrity of the industry. This would mean that the academic communities take steps to ensure the integrity of peer-review and open science, open data, and open research. Open access publications have major benefits for small academic publishers through visibility, discoverability and global distribution, but no clear business model has presented itself yet. The last presentation was by Scott Forest from University of the Arctic, also known as UArctic. UArctic is a network association of university members and others, such as PLC. UArctic works on bringing people together from the Arctic region to share knowledge. Its primary focus is collaborations and powerful networks. UArctic has 200+ member institutions and persons, an exchange program called North2north, a study catalogue, and 45+ thematic networks. The theme of the talk was the challenges of showing impact. UArctic facilitates networks, but they don’t produce concrete results and, if they do, it is hard to connect the results to UArctic. They are working on having more measurable results right now. There will be a UArctic Congress Sept.3-7 at Oulu and Helsinki. Read more at: www.uarctic.org. We ended the day with the PLC Business Meeting. It began with the announcement of the William Mills Prize winner. The committee was not present, but they sent a statement. There were 26 nominations and the winner is the book (and associated Smithsonian exhibition) Narwhal, revealing an Arctic legend. The committee noted that the book was very comprehensive and extensive. We also added three members as Honorary Members of the PLC. Shannon Christoffersen nominated Ross Goodwin, Sandy Campbell and Daria Carle nominated Ron Inouye, and Laura Kissel nominated Julia Finn. All the nominees are now honorary members. Peter Lund took over as Chair for Shannon Christoffersen, who is now Past-Chair. Andrew Gray and Laura Kissel remain in their positions of Treasurer and Secretary, respectively. Susanna Parikka is our new Chair-Elect All Ex-Officio positions are maintained with the addition of Stefano Biondo and Joe Bouchard as the new PLC 2020 hosts. We also have two new Members At-Large: myself, Cecilie Møldrup, and Bolethe Olsen, joining Shelly Sommer and Liisa Hallikainen. It was also announced that Quebec City is the PLC 2020 location. Other formalities were taken care of during the meeting, but you can read more about that in the secretary’s notes. We ended the day at a beautiful three-course dinner at a private island where we also had this year’s auction. Thursday morning began with the keynote session, “Arctic Service Design Research” by Professor Satu Miettinen. Professor Miettinen is a designer, but unlike many designers who work with products or spaces, she works with service experiences. As she noted, users’ experience of quality of service can be affected by scent, sound, and vision. As such, service can be tailored and designed, even prototyped in storyboards or video clips. 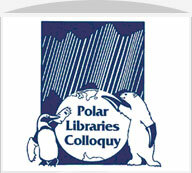 From the perspective of polar library service, it was fascinating to hear how we might work to design service provision for library users. Ivar Stokkeland, speaking for Kjell-G. Kjaer who members may remember from the Rome PLC, presented on “Arctic Marine Mammal Products in 19th century European Industries, the development of the north Norwegian sealing fleet (1859-1909) and the ‘Kjell-G. Kjaer Historical Register of Arctic Vessels.’” The history of the sealing fleet was very interesting, but Colloquy participants were particularly interested in Kjaer’s database which is online at www.npolar.no/en. The database does not require a subscription and is available in English. Laura Kissel presented next on “Thinking Outside of the (Hollinger) Box: Professional Writing for the Archives.” Laura asked if any of us knew what a Hollinger Box was or if that was a joke just for her. I confess that I did not know what a Hollinger box was — until I googled it. Although I have taken archive classes as a library student, I did not know that the gray, acid-free document boxes in archives were actually called Hollinger boxes. Now I know, and you do as well! Laura described a new Ohio State University course that involves matching students learning how to write proper grant proposals with real-world clients (in this case, the Byrd Polar and Climate Research Centre Archives). The students are given information on projects that require grant funding, research and identify potential funders, and write a grant proposal. The results of the student work may be used to submit actual grants. Given how often I have to write grant proposals in my job, as am sure many of us do, I strongly recommend we all try to convince our institutions to run this kind of course! The morning coffee break featured excellent fruit smoothies that were very popular with participants. I worked through part of the break and only managed to get a spoonful into a cup — they went fast! From that one spoonful, I can confirm that the smoothies were delicious and it has prompted me to add lingonberry preserves to my IKEA shopping list when I return home. The morning was bookended by a second keynote, “Human and Societal Security in the Arctic,” by Kamrul Hossain. Professor Hossain gave a comprehensive overview of security, explaining the traditional understanding of security as well as the more untraditional approach which broadens the term to include, for example, social, economic, and humanitarian security issues (eg food security). He also went into security theory and noted that it is not so much about identifying a threat as it is about understanding how a threat is constructed by society. Professor Hossain has written extensively on the subject and more about his work in Human Security can be found at his project website: https://www.husarctic.org/en/. Wednesday was tour day at the Colloquy. We first took a 1.5 hour bus ride north into the heart of Lapland. At Sodankyla, we visited the Sodankyla Geophysical Observatory. The main building at this site, at the time of construction, was the largest log house in Finland. This observatory has a 30 meter wide radio telescope which is used to collect many forms of natural data including information about the earth’s magnetic field, lightning strikes, and astrophysical data that allows the scientists to predict when there will be good northern lights. After a coffee break, generously sponsored by EBSCO, we had a lecture at the Finnish Meteorological Institute at the same site. The meteorologists collect data from passing satellites, as well as from a local weather station. We saw a robot weather balloon launcher, which now launches most of the weather balloons. . Lunch was at the Nesta restaurant on the site, where the meal of pasta and salad was completed with a caramel mousse. Our second stop of the day, a short bus ride away, was the amethyst mine at Luosto. Participants learned about how amethyst was created and then had the opportunity to look for stones. The “mine” is a hillside of naturally shattered rock mixed with sand. Each participant was given a basket and a small rock hammer and began searching for amethysts. Many smaller amethysts were visible on the surface among the broken rocks. Larger pieces were covered by sand. After collecting a basket of likely pieces, each person went to a washing station, so see whether or not they had found amethyst. Everyone did and was able to take home a sample that could fit into the palm of their hand. After another coffee sponsored by EBSCO, this time with donuts and traditional Finnish sweet buns called “butter eye buns”, we boarded the bus for the trip back to Rovaniemi.